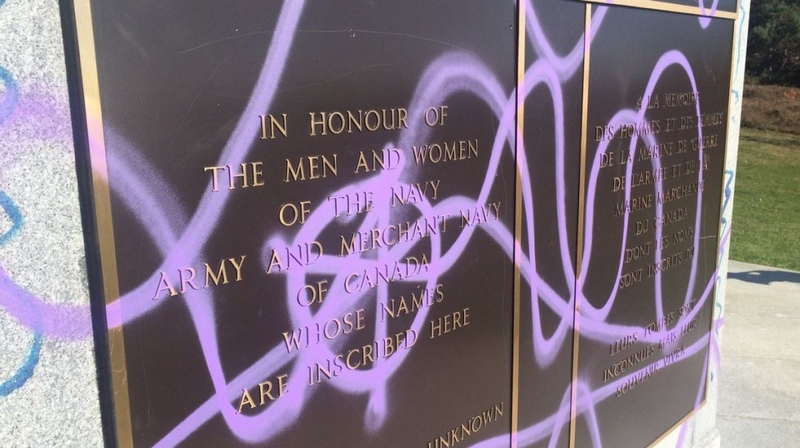 HALIFAX -- Vandals defaced a Halifax naval memorial honouring thousands who died in the First and Second World Wars overnight Sunday, but veterans and others quickly went to work removing the graffiti. 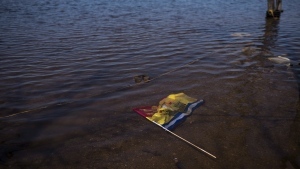 Halifax police say several historical sites within the city's oceanfront Point Pleasant Park were damaged. "Most disturbing was the Sailors' Memorial being defaced, with paint splattered over the panels containing the names of the fallen," Staff Sgt. Greg Robertson said in an email. "Anti-war slogans, including the anarchy symbol, were present." Sean de L'Eveille, who retired from a 20-year Navy career in 2011, visited the memorial Monday afternoon after his son saw photos of the graffiti online. "I was totally heartbroken. I couldn't believe the damage," he said. The Navy veteran jumped in to help those already cleaning up the paint splattered across the monument. He said he was shocked that someone would deface a memorial honouring the lives of those who sacrificed their lives for the country. "I think it's offensive ... it's desecrating a memorial for all those who gave their life for those that have the rights and freedoms they do today," he said. "For someone to do that, it's basically just spitting in their face." Halifax Mayor Mike Savage tweeted his support for those who helped clean up the paint Monday afternoon, echoing the outrage expressed by dozens of others on social media. In his tweet, Savage thanked all the volunteers "who refuse to let this offensive action stand," adding: "Another reason to give Thanks this weekend." Police said city workers will remove any remaining graffiti on Tuesday.